Fall protection is a must for any comprehensive safety plan but implementing a fall protection plan that only includes a fall arrest harness only protects a worker from the immediate danger of a fall. But once a worker is suspended from the fall, the clock starts on another dangerous condition – Suspension Trauma. 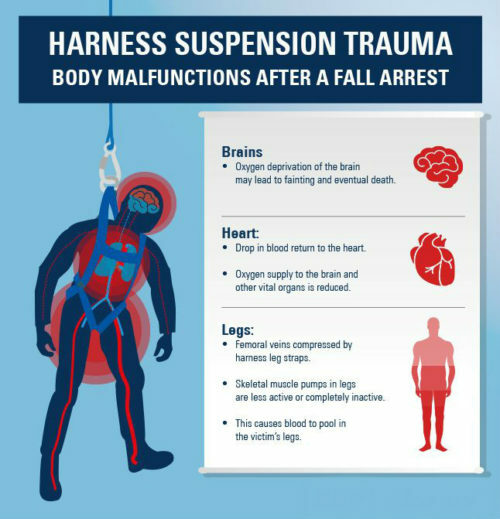 Suspension Trauma or harness hang syndrome and orthostatic intolerance occurs when the human body is held upright without any movement for extended periods of time. After coming to rest, a worker remains in the hanging position and is in danger of succumbing to Suspension Trauma the longer they remain there. As the worker is suspended, the leg straps of their harness begin to crush the femoral arteries in the legs. Adding to the dangers faced by a suspended worker, as the leg muscles are relaxed the veins in the legs can expand dramatically creating a condition known as vasodilation. Vasodilation or the expanding of the veins in the legs creates a situation where blood gathers at the legs rather than returning to the heart and lungs for recirculation (venous pooling). Ultimately this results in loss of circulation, nausea, unconsciousness, drops in blood pressure and heart rate; the longer a worker remains suspended the more likely they’ll face irreparable harm from circulatory shock. Although the complications resulting from Suspension Trauma are serious, combatting Suspension Trauma is seriously uncomplicated. One of the easiest ways to tackle suspension trauma is the use of Trauma Straps. Trauma Straps are a simple pair of straps – one with hooks the other with loops to attach the hooks – that are attached to a fall arrest harness and uncoiled when needed. In the event of a fall, a worker will be able to deploy the straps and brace their weight against the straps. This allows a worker to use their leg muscles, preventing venous pooling, and shift their weight off their femoral arteries preventing circulatory shock. The second part of combatting Suspension Trauma is incorporating a rescue plan as part of your fall protection plan. OSHA guidelines require a “prompt” rescue of a suspended worker; prompt is described as not exceeding 30-minutes. After 30-minutes, the effects of circulatory shock begin to set in; creating a rescue plan will help prevent circulatory shock in the event a worker is physically unable to deploy trauma straps or is unresponsive. Since every minute counts, knowing how to respond will help save crucial minutes and the well-being of your team. Proper training and implementation of the site safety plan are the keys to preventing workplace incidents but when an accident occurs, you can be ready to take the necessary steps to keep everyone alive. Remember, keeping everyone safe even in the event of a fall starts with having the right plan in place and ensuring everyone has the proper equipment to work with confidence. Update 04/25/18: This post contains an image from XSPlatforms from their guide on combatting suspension trauma resulting from the use of a fall arrest system. You can view the full post and download a copy of their one-page fact sheet here.